The future of the Discovery Channel’s Pitchmen show was cast in doubt after the unexpected death of series star Billy Mays. Though the show brought in decent ratings, it was hard to imagine the show continuing without the king of infomercials. Now, less than a month later, a decision has been made. And, as the expression says, “the show must go on.” Executive producer Thom Beers and co-host Anthony “Sully” Sullivan tell Eric Deggans that they’re going to try to continue the series, if they can do it in a way that honors Mays’ memory. Beers said, “I know (Pitchmen) will continue on. Absolutely, without a doubt.” He believes that the series can continue primarily because of the emotional drama created by the inventors pitching their products to Mays and Sullivan and their decision to assist them. The Discovery Channel has confirmed that a second season of Pitchmen is being developed with Sullivan, Beers, and Mays’ offspring, Billy Mays III. A premiere date for season two hasn’t been set. What do you think? Is this the right decision? Do you think it’ll be worth watching? The thing about Season 2 of PitchMen is that post-Billy, we’re reminded that what makes the show great is the people, the inventors chasing the American dream. The story lies within their successes and failures. We hope Discovery Channel smartens up, starts promoting season 2 and brings it back to their primetime lineup. It deserves the prestige. I think this show is a great way for ordinary people to showcase the possible life changing invention. I think the Billy would say let the show go on. In the spirit of great inventions by ordinary people is what Billy stood for. I vote yes. Set the stage and let the show go on. i hope they show a second season of pitchmen sometime this year. it was one of my favorite discovery channel shows. I think that this is a great thing! I was one of those people who wrote discovery and Sully expressing my feelings that Billy would have wanted the show to continue! Billy made the “info-mercial” a legitimate business and this show was suppose to be the culmination of his career. It must keep moving forward! @TOM: I agree, I was also on the fence, but really enjoyed the show. A big part of that was Billy, but Sully also is a big part of the show and I would think that Billy would want it to go on. I am glad they decided to give it another season. @Jen: You are correct. Thanks for the note! Billy Mays was actually Billy Mays, Jr. and his offspring is Billy Mays III. You might want to correct that. 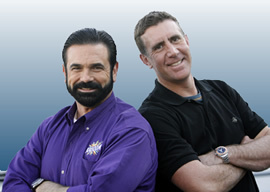 I am really on the fence with this one… There will never be another Billy Mays and in some respect anyone else on the show would be compared to him. On the other hand, part of the team was Sully and I think maybe he can pull it off.